Gigabyte's miniITX GA-E350N-USB3 motherboard requires very little power while operating with the AMD E-350's integrated Radeon HD6310 graphics core. At idle, the system sips a little as 42W! Under CPU-load conditions this figure jumps to 57W. With the IGP stressed by 3DMark the total power consumption is a modest 53W. The AMD E-350 APU is not a total loss however, far from it in fact. The little chip is sufficiently capable of filling in the role of a lightly used desktop replacement computer; a couple orders of magnitude above a Netbook when paired with desktop memory and HDD/SSD. The Gigabyte GA-E350N-USB3 is capable of modest computing tasks like email, Word, internet, media streaming, music, Media PC and HTPC applications. It's even upgradable with a full PCI Express x16 videocard, but keep in mind the CPU is soldered in place and will always be the limiting factor as PCSTATS extensive benchmarks have demonstrated. If you need an inexpensive desktop PC platform for the office, this is not it. This AMD A75-based board is a much better option. 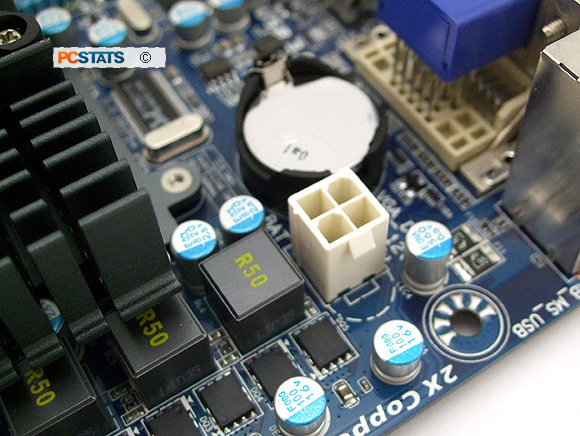 Placing the Gigabyte GA-E350N-USB3 system in the performance scale is difficult without an Intel Atom board to make direct comparisons against. However, if you're looking for an ultra compact desktop computer the Gigabyte GA-E350N-USB3 board slots-in at the lowest run on the entry level computer scale. As an all-in-one PC platform (and precursor to the AMD Fusion A8/A6 APU) it's best suited to MediaPC / HTPC applications where a good solid HDMI output, Gigabit network connection and quiet cooling are key points. The Good. 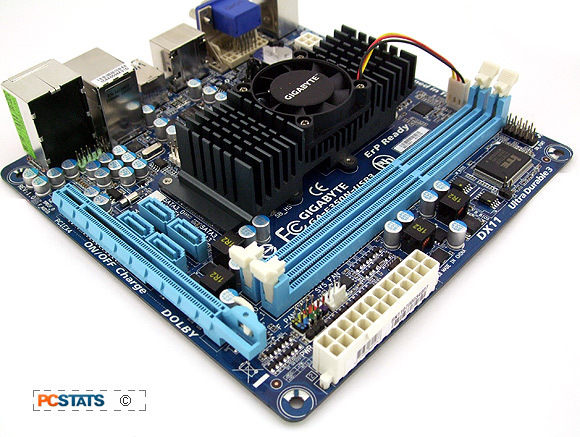 The Gigabyte GA-E350N-USB3 miniITX motherboard is well suited to MediaPC tasks thanks to it's IGP, small board footprint, high level of integration (USB 3.0, networking, SATA III, audio, etc.) and nearly silent CPU+IGP thermal solution. The 17x17cm is perfectly suited to console sized media PC chassis like this. In media playback the Radeon HD6310 IGP ranged from 25-35% CPU load, playback was smooth and stutter free. Married to the right size chassis, the Gigabyte GA-E350N-USB3 is just powerful enough for Media PC tasks. If WiFi were included on board the platform would be sheer perfection for its niche. As it stands this is easily solved with a PCI Express x1 half-height Wifi card. On that note, we're disappointed such a small motherboard requires both 24-pin and 4-pin main power connections from the power supply. Given the low power requirements of this board without a discrete videocard, it can hardly be maxing out the power available to it over a 24-pin mainATX power cable can it? To sum up. As a full desktop PC the Gigabyte GA-E350N-USB3 is too hampered by a netbook-worthy processor that's too weak and too slow at moderately intensive tasks, as Sysmark 2007 demonstrated. As a HTPC/MediaPC it's got just the right amount of power and integration in a compact footprint for streaming movies to a nearby HDTV, music out to speakers, or as a small footprint PC for very light duty.